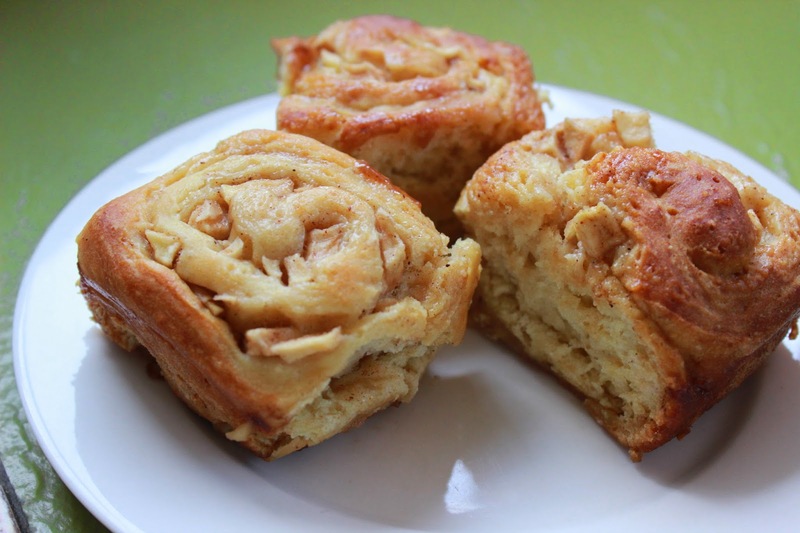 I had lots of apples and yoghurt at my disposal during the weekend, and so I decided to make up a recipe for Apple Cinnamon Scrolls as I was feeling the need for apple and cinnamon! Combine flour, yeast and caster sugar in bowl. Stir to combine, then make a well in the centre. Combine butter, yoghurt and milk in a jug and pour into well. Mix together until combined and then use your hands to form a dough. Turn the dough out onto a lightly floured surface and knead until smooth and elastic, adding more flour if necessary. Place dough in a clean bowl and cover with a damp tea towel and set aside in a warm spot to prove for 45 minutes. Preheat oven to 220°C. Spray a baking tray with oil and set aside. Knead dough again for a further 2-3 minutes. Place dough on a sheet of baking paper and roll out to a rectangle. Combine apple, cinnamon, nutmeg and sugar together in a bowl. Spread mixture evenly over dough with a spatlua and then Roll up firmly from the left to right side along the longest end to enclose filling and form a log. Cut dough log into 12-15 even slices and place side by side on prepared tray. Cover with a tea towel and set aside to prove for a further 20 minutes. Bake in preheated oven for approximately 25 minutes, or until golden and cooked through. These kept very well for four days in an airtight container, and tasted delicious warm. The smell from these permeated the whole house and definitely made my day a lot tastier! Mmmm! I love anything with apple in it! This looks delicious!